A new video from the public policy group America's Survival, Inc. documents how so-called "progressives" are now demanding acceptance of "psychedelics," or mind-altering drugs that create hallucinations. America's Survival, Inc. President Cliff Kincaid interviews Dr. Tina Trent about how Barack Hussein Obama implemented the George Soros vision of legalized dope and how the "progressive" pro-drug movement he is leading is now demanding legalization of LSD and heroin. 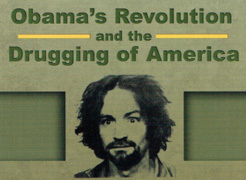 The video, titled "Obama's Revolution and the Drugging of America," is available for free viewing on the ASI YouTube and Roku channels. Dr. Trent is a writer and citizen activist who was a researcher for the ASI website www.SorosFiles.com, based on a 2011 conference designed to expose the evil plans of the Obama-supporting billionaire hedge fund operator. Kincaid's first investigative report on Soros, a convicted inside trader, appeared back in 1994 and highlighted his investments in off-shore accounts and foreign banks accused of money laundering. Powerful and wealthy supporters of Barack Hussein Obama such as Joby Pritzker of the billionaire Pritzker family are among the noted backers of the Multidisciplinary Association for Psychedelic Studies (MAPS). The group claims the use of LSD and other drugs facilitates religious experiences and humanity's progress. "This is the Brave New World of Aldous Huxley," Kincaid says in the interview, "where Soma is prescribed for the population, to keep them distracted or content.... It's also the 'expansion of consciousness,' to undermine traditional religion and implement a New Age philosophy" that will actually spark cases of mental illness, violence, and terrorism. Trent is a scheduled speaker at an upcoming November 10 ASI conference that will examine the impact of Obama's Marxist Revolution and look at the prospect of the legalization of mind-altering drugs worldwide, as recommended by the Soros-funded Global Commission on Drug Policy.